Built around 1071 Stafford Castle is an excellent example of a motte and bailey Castle. 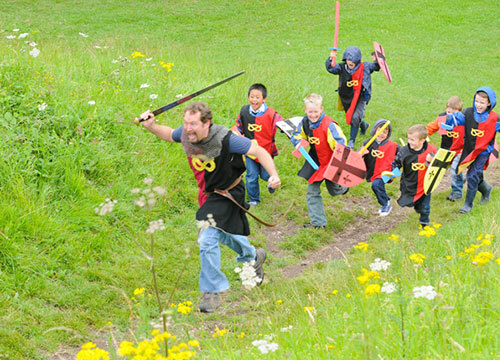 Stafford Castle is located on Newport Road and open all year round for pre-booked school tours from Monday to Friday. The castle is a place "in your own locality" linked with "significant historical events": the Norman Conquest and local Angol-Saxon rebellion of 1069. In our recreated guardhouse children can learn first hand about castles and the people who lived in them. Stafford Castle is an ideal "local history study" site, offering the opportunity to trace how "aspects of national history" are reflected locally. Puplis can set the castle in the chronological context of sequential invaders: Romans; Anglo-Saxons; Viking; and finally Normans who conquered Stafford's Anglo-Saxons and built this fortress. Pupils studying "the development of church, state and society in Medieval Britain from 1066" can see the Battle of Hastings brought vividly to life with an examination of arms and armour; they will learn how the Normans built castles like Stafford and used them to fortify their hold over a conquered people. Students can learn the varied medieval uses of herbs in Stafford Castle's herb garden and make their own lavender bags.